1. Download the historic Biota of the Santa Ana Mountains by Willis E. Pequegnat, first published in 1951. 2. Look through the pages of the biota to find a plant(s) or wild animal(s) that you are curious about. 3. Identify the canyon where the plant(s) or animal(s) existed from 1937 through 1951. 4. 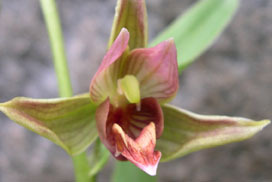 Learn how to identify the plant(s) or animal(s) using a field guide or online resource. 5. Bring a field journal or notepad and binoculars and visit the canyon to see if the plant(s) or animal(s) still exists in the specified location. 6. 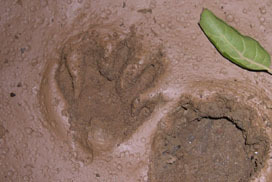 If you find the plant(s) or animal(s) species, record the full details of your experience, including the date, time, weather, location, description of species, associated habitat, and any other intriguing observations. Feel free to sketch and write personal impressions about the experience. 7.Share your experience with family and/or friends! 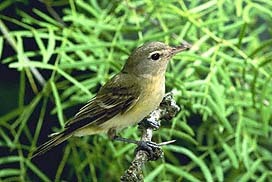 Did you know that the Least Bell's Vireo, a federally listed endangered bird species, relies on indigenous Mulefat (images) shrubs and Willow trees (images) for its habitat? 1. Get permission to take a small cutting of mulefat and willow from your local public natural area. Cuttings should be woody (3/4" to 1" thick and 6" to 12" long). 3. Stick cuttings upright in drinking glass or cup of water (submerge about 3" to 6" of cuttings) and leave by window where sunlight reaches. 4. Wait a few weeks and monitor for root growth. 5. When roots are a few centimeters long, you can plant in moist soil (either in plant container or directly in ground). Make sure soil is kept moist. 6. Eventually your Mulefat and Willow cuttings will start producing leaves and establishing their roots. 7. 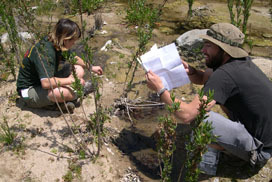 Mulefat shrubs and Willow trees are fast growing and require regular irrigation because they are adapted for Riparian (streamside) areas. 8. In 1 to 3 years, your plants will mature and become viable habitat for an endangered bird species! 1. Download and read the History of Beek's Place (personal recollections of Allan Beek), a private inholding above Black Star Canyon and Tin Mine Canyon. 2. Download and read In The Black Star Canyon chapter of Shadows of Old Saddleback by Terry Stephenson. 3. Download and read references to Black Star Canyon in A Grizzly Introduction to the Santa Ana Mountains by Jim Sleeper. 4. Visit Black Star Canyon, Tin Mine Canyon, Silverado Canyon, or other canyon that suffers from abuse and neglect. 5. Bring leather or cloth gardening gloves. 6. Bring reusable grocery bags with handles (cloth or recycled plastic). 7. Bring graffiti removal tools, such as wire brush, sand paper, removal chemical (non-toxic/eco-friendly), powder clay, spray bottle, and water. 8. 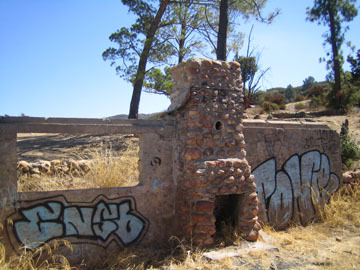 Remove litter and graffiti as you enjoy a beautiful journey in the Santa Ana Mountains.